The rhythms of life ebb and flow. As the seasons change, so does my routine. In the summer, when I awake at 5:30, the sun is climbing, painting the sky in streaks of honey gold. I make a cup of tea and wander out to sit next to the hive. The bees are up to greet the day, lazily crawling around on the landing board and taking timid flights in search of pollen and nectar. As the days grow shorter, I awake in the dark. I make my tea but wait over an hour for the first rays of sun, weak and straining to push back the night. I can hear the hum of the hive as I approach, but they do not emerge until later when the warmth beckons them from their cosy home. There is little food for gathering and I am feeding them regularly. The birds that once greeted the day and my arrival at my chair by the hive, are silent or absent, having headed south for warmer climates. Frost crusts the grass and makes the wooden deck slippery in the early morning. My barefoot trek to the hive now requires footwear and sweaters. Soon it will be boots, gloves and coats I must don before venturing out. Wood smoke from the neighbor’s chimney scents the air, replacing the heady aroma of flowers in bloom. How many more days are left when I can set up my office on the deck in the sun, my world of work in front of me, my band of four-footed companions spread out around me? Perhaps not many more in this season, but seasons come and go. This month is the one year anniversary of my unemployment, my dive into life without a six-figure salary and all that went with it. I still haven’t cleaned out that closet, perhaps because a year is not long enough to believe I have experienced anything but a taste of my dream. I sat in the grass with a friend today. We watched the little herd of five mares in the pasture. Life has beaten both of us up lately, but instead of wailing and keening (though that does need to come) we sat quietly and just observed the social order of the herd. The morning’s ration of hay was growing thin along the fence line and each horse was jockeying for position near what was left. Their pasture is short but green, so it was merely a snack before a day of grazing. Three of them, Lauren’s mare Blessing included, were literally eating nose to nose, snatching strands from each other’s mouths. Belle, who struggles to be the boss mare, sulked and hovered at the edges, nervously eyeing the pile that was left. Night, my mare, stood in the middle of the pile facing away from the others. With her head down, her peripheral vision allowed her to see exactly where all the others were and what they were doing. When one ventured too close or walked by, her head came up and her ears went flat. If that warning wasn’t recognized she swung her body at the intruder, hind hooves positioned for the next level of warning. At one point, Belle tried to interfere with the other three and Blessing crow-hopped backward, chasing her off. But Blessing is not head mare so Belle pursued. Night left the pile and lunged between the two, like a mother reaching into the back seat of the car to swat squabbling kids. With the pile of hay unguarded, everyone swarmed. Night looked back, then sauntered off to graze. She had proven her point. What fascinated us was the idea that there are no hurt feelings, no grudges, just understanding of the order of things. Who knows? Maybe Belle and Blessing are smart enough to come up with a scheme to get Night off the last pile. Coats are growing soft and fuzzy on the horses. 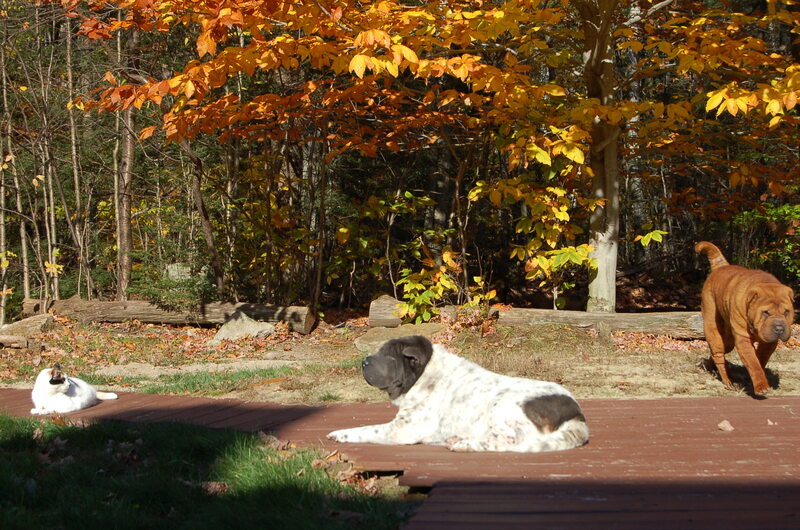 Dogs and cats are soaking up the last warmth from the wood. The bees are lazy and content in their hive. I am privileged to observe their rhythms. This entry was posted in memoir, Seasons. Tagged Bees, communication, daylight, horses, mares, order, seasons, unemployment. Next Post Next post: Loss of innocence or loss of judgement? Nice. Lovely warm mental images. Thank you. If only people were “smart enough” to follow the natural rhythm of life. Love the comparison of a mother reaching into the back seat! thanks Laura, I love watching the interactions of animals, they are so honest. Very nice. I enjoyed this! When the words or ideas fail to appear for me I like to at least post a photo with maybe a quote to accompany it or I just take a day or two off. May be too soon for me to re-blog seeing that I haven’t been doing this yet for even six months but a good idea to keep in mind! Hi Julie. A photo is always good for inspiration. I find the visual helps me get out of a slump for words. Six months is a milestone for cranking out a post on a regular basis. Keep up your good work – it pays off in unexpected ways!! I just realized that I’ve never watched horses eat. It should probably go on my list of things to do. It is peaceful and their social order is interesting. I love just sitting and observing my animals – their view of the world is so simple. Thanks for dropping by and commenting. It sounds so idyllic. You paint a wonderful picture of your morning. Reblogged this on La Dana de Girona.